The urge to make beer at home seems a logical next step for someone who likes to drink craft beer as much as Michael does. 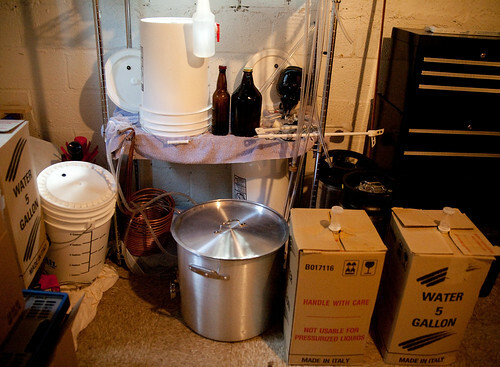 He became a home-brewer by investing about $500 in the supplies and storing the beer in recycled beer bottles and growlers. He makes a new batch of beer about every other month, and also brews ciders. 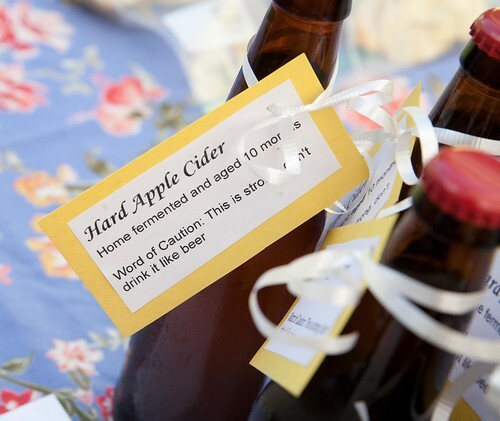 Jordan brought delicious bottles of their home-brewed hard apple cider to our recent food swap. When Michael’s parents remodeled their kitchen and their old refrigerator came available, Michael decided to up his game and install a kegerator. Jordan was dubious at first about adding a huge appliance to a small, unfinished basement room, where their basement bathroom didn’t even have walls yet. But she eventually relented after Michael said she could paint the front with chalkboard paint. 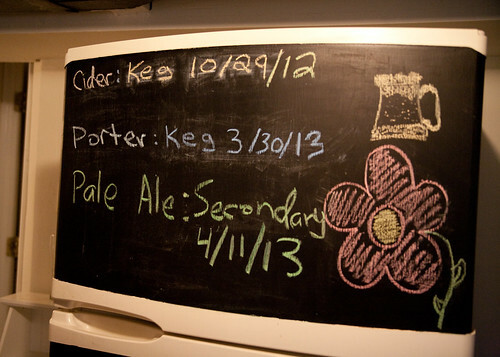 It’s a great way to list the ciders and beers they have on tap and the dates they hooked them up. What is a kegerator? 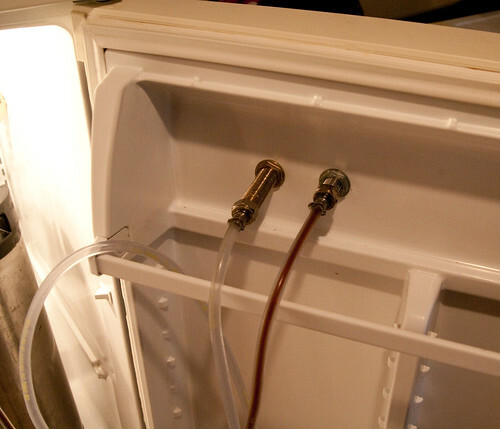 Quite simply, it’s a refrigerator modified to contain a keg and dispense beer. It keeps the beer nice and cold and ready to tap. 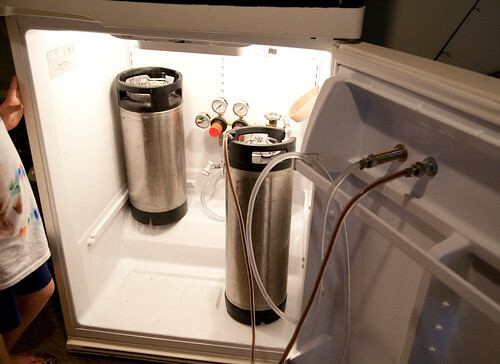 You can rig one up for a store-bought keg, but Michael runs his homebrew through his kegerator. To install the taps on the outside of the door, Michael bought a $30 drill bit, sized to fit the taps. It’s quite a simple setup, if you know what you’re doing with the CO2 tank and regulator. Jordan poured a nice dark pint for me to taste during my visit and, boy, was it delicious – smooth and rich, with a deep caramel flavor. Michael showed me around his home brewing “lab.” He says that making beer at home starts by basically brewing tea with the grains, in rinsed and sanitized containers. He buys his supplies from one of area local brew stores: My Local Home Brew Shop in Falls Church, or from Annapolis Home Brew. 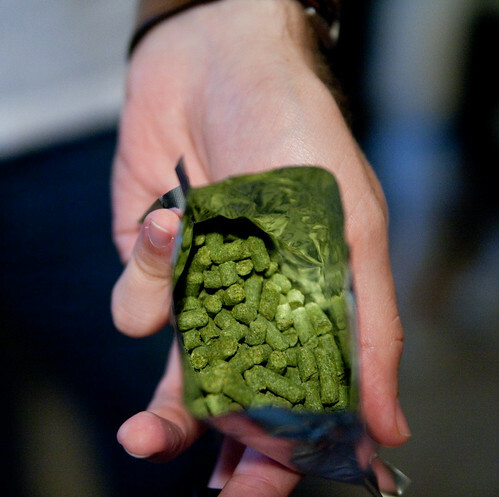 The hops, when pressed into nuggets, look suspiciously like rabbit food. 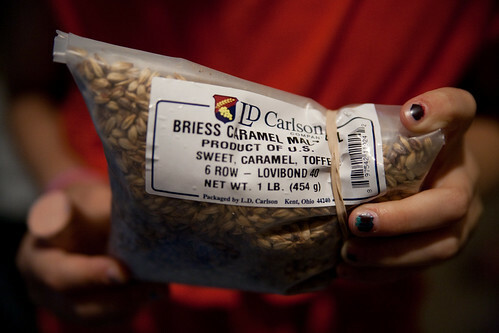 Using a beer-making recipe, Michael follows these basic steps: he makes “mash” from the grains by adding sugar, cools the mixture, adds yeast to the “wort,” and then boils the mixture. 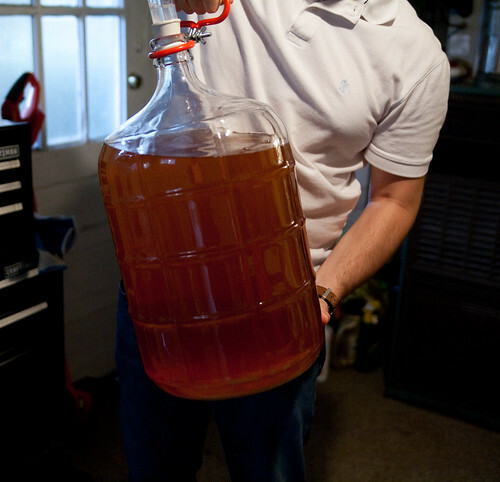 After cooling the mixture, he strains and lets the liquid sit for fermentation in a sanitized “carboy” with tubes attached that let the carbon dioxide escape. Next, he moves the wort to another container for the final stage of fermentation for about 2 weeks at room temperature. After the initial investment, Michael says that maintaining the hobby is quite inexpensive. It’s really fun to try making different brews and he enjoys having friends over to taste his latest batch. I’ve seen a kegerator rigged up to a tap next to the kitchen sink. 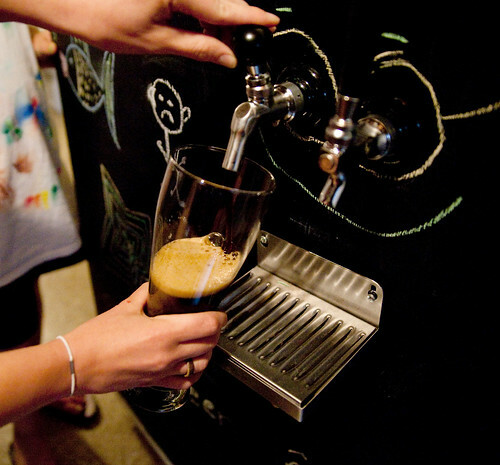 Would you consider installing one and brewing your own beer or cider?